So to start off with some context, I'm rather new to UI design. I've made a couple of very small VNs before (both in TyranoBuilder) and didn't bother with customizing that aspect since both games were just to practice what a visual novel actually is. I've been working on my first larger project for a little while now. And the other day I saw the Visual;Conference video on the important of UI Design (which you can find here if you wanna hear some interesting discussion on that sort of thing). The idea of bringing interesting elements directly into the main UI rather than hiding stat bars in a separate menu like I was planning to do caught my interest so I figured I should design the UI sooner rather than later to plan around it. I knew I wanted my protagonist to have a side image since he doesn't have a full sprite. I knew I wanted to implement the 'personality quirk' sliders into the main view so that when the player makes a decision that affects them, they can watch and see it happen. And I knew I wanted the buttons to look a little quirky since I have trouble doing plain text buttons without making them look totally sterile and bland. But I realized there was something I totally didn't account for. Whenever Harvey isn't there, the Quirks box makes it look totally imbalanced. I find side portraits for visible characters to be very redundant so I don't want to add that. So I thought I'd ask on here. 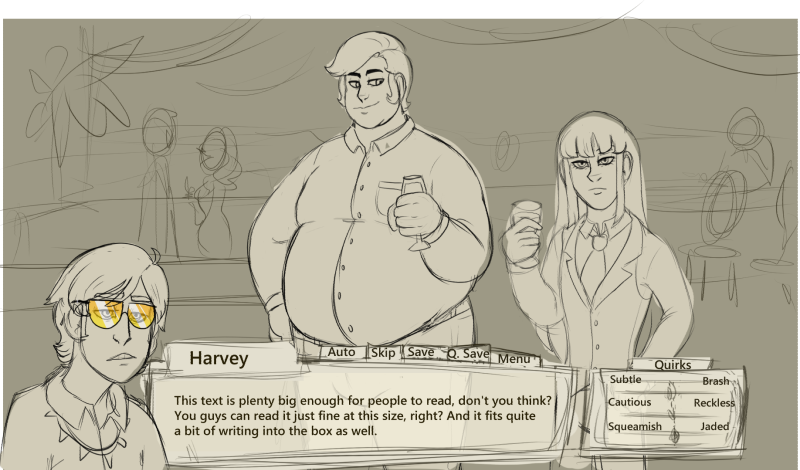 Should I add a placeholder for Harvey's spot, scoot everything over and make Harvey overlap it more, or just try to find a way to make the Quirks stat screen collapsible? In addition, any ideas on how to make a UI look more polished? I haven't gotten around to changing the text and name fonts and such yet other than shrinking them, but critique on anything else would be much appreciated. It took a lot of fiddling since I'm new to coding, but thank god for the Ren'py cookbook part of the forum hehe. I managed to make the quirks sliders collapsible and it looks a lot nicer. Also got them to animate (this gif makes it look choppier than it is) so I'm pleased with that!